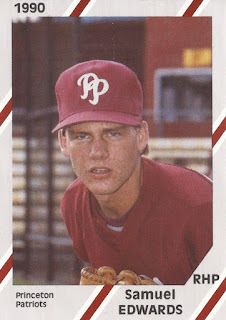 Sam Edwards signed with the Phillies directly out of Florida's Gateway High School in June 1990. He made clear to The Orlando Sentinel that, for him, the pros proved his only choice. "I've been going to school for a long time, but my number one priority is playing pro ball," Edwards told The Sentinel after signing. "The sooner I get into the flow and get my feet wet, the quicker I'll move up in the organization." The star of the Gateway High School pitching staff soon started his pro career in rookie ball. Once he got his feet wet, however, he moved up little. He made single-A Spartanburg in his fourth pro season. That season also turned out to be his last. Edwards' career began that year in 1990, taken by the Phillies in the 32nd round of the draft out of Gateway. He's also credited by his formal name, Samuel Edwards. In the run-up to the 1990 draft, Edwards made some noise on the field. He turned in an 11-3 record and recorded a 1.05 ERA to lead his county, The Sentinel wrote. Before pitching in front of scouts at a state All-Star baseball classic, Edwards talked options. "The Phillies and Minnesota have called the house; but if they don't offer the best deal, college is my best bet," Edwards told The Sentinel. Edwards soon nailed down the college option. He signed with Brevard Community College in late-May. Brevard coach Ernie Rosseau was happy to have him, he told The Sentinel after the signing. "He's an outstanding control pitcher with pretty good stuff," Rosseau told The Sentinel. "It's a nice combination. Usually, pitchers have one, but are shortchanged on the other." Edwards, however, soon spurned Brevard for the Phillies. Edwards started at rookie Princeton. He got into nine games in relief and recorded a 9.75 ERA. He moved to rookie Martinsville for 1991 and stayed there for 1992. He had a 4.98 ERA in 1991 and a 5.67 mark in 1992. His 1992 numbers also included a brief stint with short-season Batavia. Edwards' final pro season came in 1993 at single-A Spartanburg. He went 3-6, with a 4.38 ERA over 15 starts, ending his career.